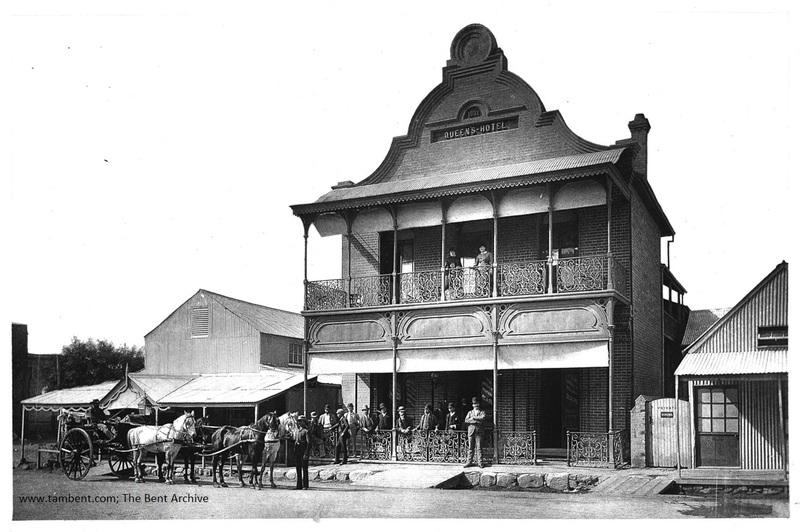 The Queen’s Hotel, Kimberley, around 1880. But let’s focus rather on the Queen’s Hotel, Kimberley; it still stands (at 10/12 Stockdale St). Well into its second century now it is not what it was, of course, but it stands for something. Theodore and Mabel Bent are on their way in early 1891 from Cape Town, by train, to explore the ruins of ‘Great Zimbabwe’ for Cecil Rhodes, and the couple stay at the hotel, a focal point and metaphor, from 26 February to 3 March 1891. The gables of the impressive structure, fashioned after the Dutch Cape Colonial style, bore the legend ‘1881 Queen’s Hotel’, carved in relief on inset panels. We clearly have a fancy brick edifice here, with elaborate, wrought iron verandas. At the time of the Bents’ stay the proprietor was probably one Henry Orkin, but the hotel’s prestige dates from the first phases of the diamond rush in the 1860s, and the later arrival of James and Catherine Jardine (Scots) from Pniel. Catherine bought the single plot, double-storey building and within a few years had added another twin double-storey structure to her hotel. But by the Bents’ arrival Catherine had retired back to Cape Town. Kimberley, like it or not: the times were as they were, and all roads led to Rhodes. Arguably and extraordinarily, the diamonds from Kimberley (and gold from nearby) were used to buy what became Rhodesia, which went on to become Zimbabwe; and the wealth from these diamonds continues to circulate, somewhere – such forces don’t just disappear, we are talking Wagner here. Much of this (diamond Ring) story materialises within a couple of hundred metres of the Queen’s Hotel, Kimberley, in the second half of the 19th century, around the frenzied wheelers and dealers gravitating to southern Africa in search of fortunes, and totally heedless of the consequences of their activities, then and now. ‘Nothing in the external appearance… suggests either its fame or its wealth’, wrote Lord Randolph Churchill of Kimberley. 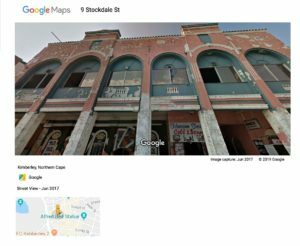 Formerly ‘New Rush’, the town was named (June 1873) after John Wodehouse, 1st Earl of Kimberley, and became the capital of the Northern Cape. Few places on earth have generated, so quickly, so much power, greed and exploitation, beginning, in 1871, with a rough diamond of some 83 carats found on the farm called Vooruitzigt, belonging to the brothers De Beer. The story of how most of Kimberley’s mines were gradually acquired by Rhodes and his cockney, maverick sidekick, Barney Barnato, under the corporate banner of De Beers Consolidated Mines, is the stuff of legend and business-school texts. The great workings in the town, the ‘Big Hole’, are a tourist attraction still: ‘[One] of the most astonishing memorials to the impetus of avarice… [The] whole vast mess of the Big Hole was covered in a mesh of ropes, gently shimmering in the hot wind like an enormous spider’s web… The Big Hole, disused since 1914, became the largest man-made hole in the world – a mile round the top and nearly 700 feet deep’ (Jan Morris, ‘Pax Britannica, The Climax of an Empire’, 1998). 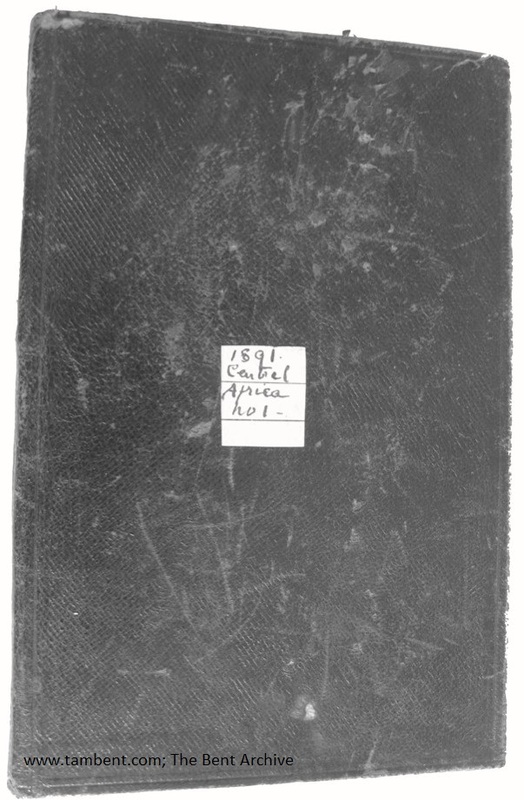 Mabel Bent’s ‘Chronicle’ for 1891 – Central Africa. The Bents’ planned adventure of 1891 had been the talk of London’s Royal Geographical Society for several months: ‘Mr. Theodore Bent’s Expedition to Zimbabye: Mr. Bent left England last Friday (January 30th) on his mission to explore the strange ruined buildings in the gold region of South-east Africa. An unfortunate error in our note on this expedition in the January No. of the ‘Proceedings’ escaped correction in proof. It is the Chartered South African Company (not the East African) which has interested itself in Mr. Bent’s archaeological and topographical exploration. This company and our Society have each contributed a grant of 200l. towards the expenses of the expedition’ (‘Geographical Notes’, Proceedings of the Royal Geographical Society, Vol. 13, No. 2 (Feb., 1891), 105). Resting at the Queen’s Hotel for a few days, Theodore and Mabel acquired the assets needed for their expedition (north to ‘Great Zimbabwe’) from the ‘Colossus’’ Alberichian lieutenant, Rutherfoord Harris. Dr Frederick Rutherfoord Harris (1856–1920) had qualified in Edinburgh, moving to Kimberley ten years before Mabel meets him. His rise in Rhodes’s service was rapid. Brian Roberts (‘Cecil Rhodes. Flawed Colossus’, 1987) describes him as a ‘coarse, ambitious adventurer… [who] came to be regarded as a loudmouthed braggart and born intriguer, whose penchant for mischief-making caused Rhodes endless trouble.’ But he clearly had something, and after his master’s death he is back in England by 1905, where he was ‘associated with some few finance Cos… and entered the arena of British politics in 1900 as Conservative M.P. for the Monmouth Burghs… Dr. Harris is a keen dog fancier, and is very popular in South Wales, where he spends most of his time’ (W. H. Wills and R. J. Barrett, ‘The Anglo-African Who’s Who & Biographical Sketch-Book’, 1905). Wikipedia adds a sad coda – that his widow, Florence, “hanged herself three months after his death in 1920, apparently overcome by grief”. But thirty years before, in mercantile Kimberley, C. H. Weatherley, the B.S.A.C. Secretary in London, on Rhodes’ instructions, had already prepared Dr Harris to expect the Bents: ‘The Company’s contribution (viz: £200) towards… expenses has been paid to Mr. Bent, who has also been promised the Company’s assistance in the arrangement of his finances in connection with which he yesterday handed me a cheque for £1000. This sum has been placed to the credit of the Kimberley Office account, to be paid by you to Mr. Bent… [Please] provide Mr. Bent with letters of introduction… to any other persons whom you think can render assistance to [him] in his important and interesting expedition’ (B.S.A.C. ‘Out’ Letters, Rhodes House, MSS. Afr. s. 70-84, Folio 262/3, 22 January 1891). The ‘expedition’ was indeed important to Rhodes – Bent’s theories on the ‘Great Zimbabwe’ site suited his colonial ambitions for the territory. Opening page of Mabel’s 1891 ‘Chronicle’. Thus set up, by the end of February 1891, the Bents had reached Kimberley, Mabel Bent recording the approach and arrival in her ‘Chronicles’, the indispensable diaries she kept for every year of the couple’s explorations: “We saw Miss Olive Schreiner, the authoress of the ‘Story of an African Farm’ and started at 8 on the 26th [February 1891] for Kimberley, which we reached next morning. The train goes very slowly and stops a good time outside each station and any time else that the driver pleases. Once it went off too soon, without us but kindly came back. Between Worcester and Matjiesfontein we had permission to travel on the cowcatcher over the Hex pass. 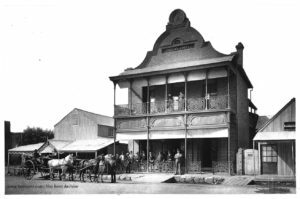 It was a delightful break in the monotony of the journey over the Karoo desert… On reaching Kimberley [Friday, 27th February 1891] we found that Dr. Harris had engaged rooms for us at the Queen’s Hotel. He belongs to the British South Africa Co. and had been kindly buying our wagons and having them fitted up; also 36 oxen and provisions for four people for 6 months… We went down the De Beers diamond mine, 800 feet, dirty and disappointing, and also went into the compound where black people live for 4 months, only going to the mines – that was more interesting. Most men were dressed in blankets and they certainly seemed to have any amount of trousers, but they were nearly all spread out on the ground or hung up. All the store of diamonds was very wonderful to behold. Very few were comparatively white and many looked like lumps of gum Arabic… On Tuesday [3rd March 1891] we left Kimberley for Vryburg. The wagons were on the train and the oxen and all the provisions, so we took up 10 trucks. We travelled more slowly than ever. One could hear the grasshoppers above the noise of the train…” (Travel Chronicles of Mabel Bent, Vol. 2, pages 47–49). Such a place was Kimberley then, and the Queen’s Hotel in Stockdale St. The grasshoppers will, no doubt, remain when the diamonds have gone… honey take me dancing. 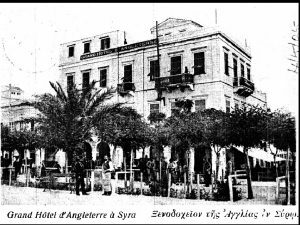 Just one of a catalogue of hotels and other establishments patronised by the Bents during their twenty years of explorations to the Mediterranean, Middle East, and Africa, from 1880 to 1900 (see the interactive maps on this site for additional info!). Next time you’re sailing via Sýros, stroll into Miaouli Square (Πλατεία Μιαούλη) in the centre of Ermoúpoli – just 100m up from the sea. There (turn left as you enter the square) you will find the splendid old edifice that was the Bents’ hotel of choice in the 1880s – The ‘Grand Hôtel d’Angleterre’. It’s in a sorry state at the moment though, with just the street level occupied as cafés. But it takes no imagination at all, as the light fades on a warm evening, to see the Bents on a balcony, listening to the trombones and clarinets in the bandstand below, as white-aproned waiters serve spritzers to the fashionable. Raise your boaters to them if you wish, for they sail in the morning on their travels – they will nod back for sure. 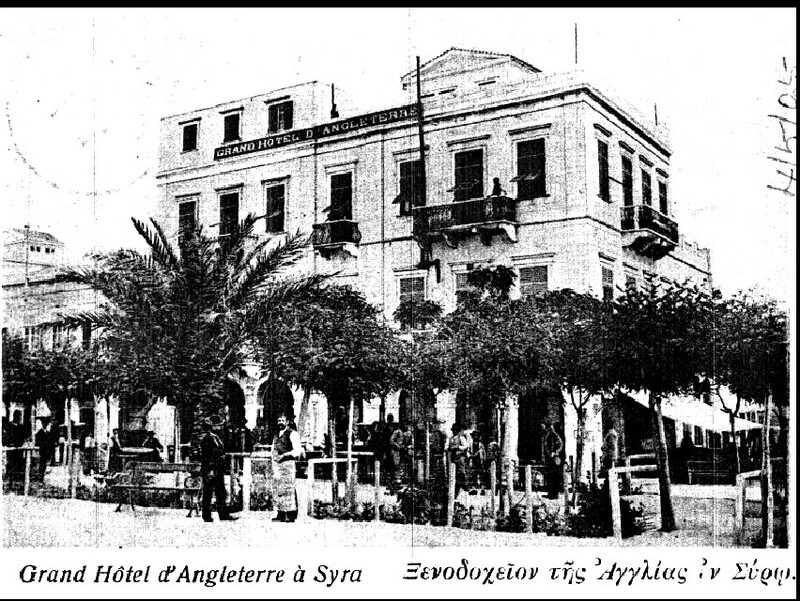 The photo shows the ‘Grand Hôtel d’Angleterre’, Ermoúpoli (Sýros), a reproduction based on a contemporary postcard of the time (taken from ‘The Travel Chronicles of Mabel Bent‘, Vol, I (p.358), (and (©) Gerald Brisch and Archaeopress, Oxford).